In Chapter One, Showers introduces the reader to the topic of African immigrant women nurses in the health care field in the United States. Centering her analysis on the experiences of West African immigrant women nurses, Showers is interested in understanding the following questions: How do international gendered and racialized hierarchies around care work affect African immigrant women in nursing? What factors facilitate the entry of West African women into the health care industry in the United States? What are their experiences in the field of nursing? Through in-depth interviews, Showers places the migration stories and experiences of these women in broader conversation with scholarly work on US immigration policies, immigrant social networks, and black immigrants in the United States. Chapter Two explains the research design and methodology used in the dissertation. This study was conducted in Montgomery and Prince George’s counties in Maryland and in Northeast Washington, DC. Shower’s sample consists of African immigrant women who emigrated to the United States and now work in the nursing industry. Their ages range from early twenties to late sixties. A small sample of African immigrant men working in the nursing industry is also included in order to “understand the particular gendered dynamics at play with regard to the organization of the nursing field and hierarchies within nursing” (p. 50). The African immigrants included in this study are from the West African countries of Ghana, Liberia, Nigeria, and Sierra Leone. Showers was able to gain access to this community in three main ways: through church congregations, nurse recruitment centers, and immigrant community associations. The primary data sources are 55 in-depth interviews with African immigrant women nurses and male and female administrators of nursing homes and staffing agencies. Showers also draws on fieldnotes collected while doing participant observations at staffing and recruitment agencies, churches, and immigrant-centered community events. Drawing on Sheba George’s (2005) work on “autobiographical proximity” (p. 62), Showers discusses at length her insider/outsider status as it relates to her research and her own biography. As a Sierra Leonean by birth with ancestral connections to Nigeria, Showers takes time to reflect on how this insider status helped to build bonds and gain access to the African immigrant women nurse population. She also reflects on how her outsider presence as a PhD student proved difficult in connecting with some of her participants. Showers notes that there were a few instances in which her participants were shocked to learn that she was not a nurse. Showers discusses how her “autobiographical proximity” (p. 62) informs not just how she conducts research, but also how she thinks through the conceptual frameworks underlying her research questions. Chapter Three analyzes the factors that motivate African immigrant women to leave their homelands and the role that the United States plays in the migration. The first section of the chapter focuses on theories and explanations for global migrations. Whereas African immigrant women can be situated in some of the existing theories of global migration, their experiences also challenge many of the built-in assumptions of this scholarship. Showers’s key finding in this area is that African immigrant women do not fit into the singular categories/typologies used in the immigration literature. Scholarship on immigration laws suggests that singular labels such as “economic migrant,” “refugee,” or asylum seeker” can capture the “essence” of an immigrant (p. 95). Showers, however, finds that for African immigrant women, and possibly many others, the immigration process is much more complicated than this, and some women cross various immigration categories, often times changing their status from temporary to permanent residences at different points during the migration process. Moreover, contrary to the common assumption by some scholars and the broader society that “immigrant women are poor, unskilled workers who migrate as secondary migrants following husbands who are the principal migrant” (p. 96), Showers shows that most of these African immigrant women are highly educated, privileged women who held jobs in their home countries prior to immigrating to the United States. Therefore, African immigrant women challenge the notion that immigrant women are poor, unskilled, and uneducated. Interestingly, Showers finds that for some African immigrant women, entering the United States led to ambiguous social designations and downward occupational mobility. This finding diverges from earlier scholarship on gender and migration that argues that women’s increased participation in the labor force undermines patriarchy and liberates women from gender oppression, since the immigrant women nurses in this study were already part of the labor force in their home countries. Migration did not “liberate” them from gender oppression, but instead made many of these women the “primary breadwinners or more economically central to the financial running of their homes” (p. 111). This led to the renegotiation of gender roles, marital problems, and sometimes separation and divorce. The second section of Chapter Three focuses on the migration stories of the women and their motivation for emigrating and entering the nursing field. Their motivations for leaving their home countries varied, with war, economic hardships, political insecurity, and family reunification being the most often-cited factors. Showers not only focuses on the exiting context (p. 82) for these women, but also emphasizes how the context in which these women enter affect the migration journey as well. Most of these women were able to enter and legalize their status in the United States through the immigration law provisions of family reunification, the diversity lottery, and refugee status. Showers argues that only through “legalizing” themselves were African immigrant women able to eventually enter the high-skilled nursing profession. One last key finding discussed in this chapter diverges from the international nurse migration literature. The scholarship on international nurse migration focuses on women entering “into nursing with the desire and the expectation to emigrate. The majority of women in this study became nurses after entering the United States, and those who were nurses in their home countries prior to emigrating “characterized their decisions to enter the field of nursing as resulting from their love of the profession or their caring dispositions. None in the sample expressed that they entered into nursing in their home countries because of the promise of opportunities for emigration” (p. 100). Chapter Four argues that African immigrant women become incorporated in the nursing industry in four main ways: racialized hierarchies in health care that idealize women, women of color, and immigrants as natural caregivers; systemic downgrading of credentials earned from home countries; lack of opportunity in other labor market sectors; and social networks. This chapter also traces the history of the “Crisis of Care” in America (p. 134) and how the expansion of Medicare and Medicaid aided in the labor shortage of nurses throughout the United States. The current care crisis in the United States is believed to be a result of the baby boomer generation’s living longer. Additionally, with the increasing participation of women in the labor force, there is a need for paid health care and reproductive care in homes and institutional settings such as hospitals and nursing homes (p. 134). Showers argues that embedded in the expansion of state-subsidized Medicare and Medicaid is the idea that “this work is delegated to family that are caregivers and in their absence low-waged vulnerable populations” (p. 138). These low-waged vulnerable populations oftentimes are made up of poor women, women of color, and immigrants. Drawing on interviews with African immigrant men and women in administrative positions in the nursing field, along with her fieldnotes, Showers illustrates how the nursing industry uses gendered and racialized narratives to implicate immigrant women and women of color as ideal for home-based and institutionalized health care labor. Many of the participants in this study used essentializing language to characterize African immigrants—especially African immigrant women. One participant states, “The African woman is bred to care and nurture. The West African woman in particular is caring and nurturing” (p. 151). Another argues that the immigrant mentality of “work to the bone” facilitates African immigrant women into health care work (p. 152). Additionally, some participants expressed the general racial hierarchies in specializations within the healthcare industry, where West African nurses tend to be placed in the “ghetto” sections of the industry—nurses and home health care aides (p. 162). In this chapter, Showers emphasizes the importance of the administrators of home health care brokerage agencies and how they serve as labor brokers that supply the DC economy with low-wage health care labor (pp. 193–94). These businesses not only provide “front line caregivers, but as labor brokers who had made the journey before, advised potential migrants about immigrant destinations and provided advice on navigating the bureaucratic processes that aided their migrations” (p. 192). In addition to home health care agencies providing formal, professional networks for African immigrant women entering the United States, informal networks were just as important. West African women informal networks shaped women’s desires to enter the field of nursing as “nursing was the talk around town” (p. 182) and was viewed as an avenue for economic and material success among West African immigrant women. The key finding in Chapter Four is that African immigrants come to the United States on their own accord and because of obstacles in the labor market, and they create a place for themselves by becoming not just nurses in the health care industry, but also business owners and entrepreneurs. This migratory incorporation path is unlike the organized and systemic immigrant networks of previous studies that “created a steady pipeline from nursing schools in India and the Philippines… to hospitals and nursing homes in the United States via recruitment agencies and other transnational actors” (p. 193). Chapter Five turns its focus to the experiences of West African immigrant nurses in the health care industry. Showers finds that African immigrant women nurses often used an intersectional approach when discussing their identities and locations in the nursing industry. These women believe they occupy the bottom of the racial system at work due to their being black women from Africa, whose accents and foreignness oftentimes cause coworkers, patients, and patients’ families to question their competency. This finding by Showers challenges the assertion in the literature that black immigrants distance themselves from African Americans in order to receive preferential treatments from employers. Instead, what Showers finds is that African immigrant women’s race, gender, and foreignness disadvantage this population in the nursing industry (p. 247). African immigrant women nurses also reported believing that other immigrant women from other countries, specifically India and the Philippines, would often side with white nurses against them. Filipina and Indian women nurses were perceived to be given preferential treatment over African nurses as well (p. 202). African immigrant women nurses also discussed how they were often mistaken by patients and their patients’ families to be nurses’ aides, while white nursing aides were presumed to be the nurses. These immigrant women also “narrated experiences where they felt that their authority, knowledge, and aptitude were questioned by patients and family members who they believed assumed they did not know what they were doing” (p. 205). Strategies to combat racism and discrimination involved highlighting their own intelligence, caring personalities, and professional orientations to work; seeking educational credentials and advanced degrees in the field; reporting individual acts of discrimination to supervisors; and distancing themselves from other blacks and from co-ethnics. Interestingly, some African immigrant women nurses distanced themselves not only from African American and other black nurses, but also from nurses of their same ethnic group. Showers terms this “professional distancing” (p. 230). Because the nursing industry is “ghettoized” due to the large concentrations of black women and immigrants of color (p. 232), some African immigrant women nurses projected an image of professionalism and caring as opposed to their co-ethnics who they perceived to be purely opportunists (p. 231). The strategy of distancing oneself from other blacks and co-ethnics adds to the literature on immigrant blacks that assumes that distancing oneself from a black identity (read: African American) mitigates negative consequences. Showers shows that these African immigrant women nurses distance themselves from any “racial or ethnic identity that they find to be a cause of disadvantage” (p. 248) within the nursing industry. Chapter Six concludes the study by reiterating the main findings from chapters Three through Five. Chapter Three argues that African immigrant women were able to enter the United States through immigration provisions that made them “legal” immigrants. This legalization accounted for their ability to enter the mainstream labor market as professional nurses. Singular categories and typologies outlined in the literature on immigration did not apply to these African immigrant women as they oftentimes occupied various visa provisions. Chapter Four shows that African immigrants are not only care workers, but also business owners and entrepreneurs. The nursing agencies were crucial in facilitating African immigrants into the nursing industry in the United States. In a market that has a high demand for home health care workers, African immigrants served as both cheap labor and business owners. Chapter Five focuses on the experiences of African immigrant women nurses and on how their foreignness disadvantaged them within the nursing industry. This chapter also narrates the strategies used by these women to combat racism and discrimination. Some women engaged in “professional distancing” by drawing boundaries between not only themselves and other blacks (African Americans, Caribbeans, etc. ), but also co-ethnics, as a way to distinguish themselves. The concluding chapter sees Showers return to the migration narratives of the women who participated in her study. She concludes by arguing that the women nurses in this study have indeed achieved the American Dream “as measured through material possessions and materialism: homes, nice cars, financial security to ensure comfortable lives in the United States while also providing the opportunity to remit monies to loved ones in the respective home countries” (pp. 269–70). This success, however, has come at a price for these women. The financial and material success has come at the expense of working long and difficult hours at physically demanding jobs. Despite the challenges, the pure determination and agency shown by these women to provide a better life for themselves and their families should not be lost. Shower’s dissertation is far-reaching in its contributions to various research fields. Whereas it contributes heavily to the literature on gender, migration, and immigrant social networks, its most brilliant intervention is its engagement with the African immigrant population. Although they constitute a growing population in the United States, scholarship on the incorporation of African immigrants, let alone African immigrant women, is scarce. This dissertation provides a start at uncovering how African immigrants will become incorporated into the American experiment. Syracuse University. 2013. 304pp. Primary Advisor: Linda Carty. 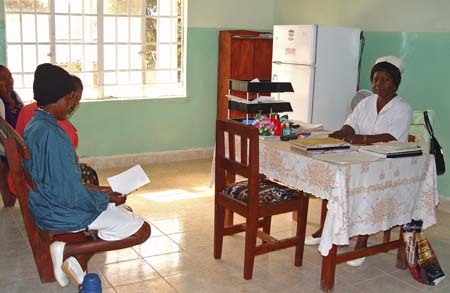 Image: Nurse at Koidu Hospital consulting with patients, from Wikipedia.